The following shows the recent developments. The SNB is intervening, raising the EUR/CHF upwards. For us, the price of the intervention is too expensive – with a 1 CHF for a dollar and 1,13 and more for Euro. 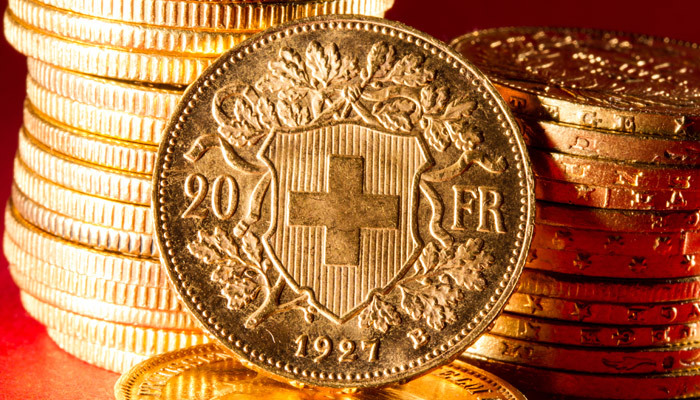 The SNB was selling FX positions, despite the fact that the EUR/CHF was under 1.13. See the FAQ below: It is not up to the SNB do decide if they sell FX, but it depends on its funding situation on sight deposits and cash. 12 April 1.1294 1.1276 -26.3k -102.2k +0.3 bn. per week 576.6 bn. 484.7 bn. 91.9 bn. 05 April 1.1209 1.1218 -26.3k -99.2k +0.2 bn. per week 576.3 bn. 485.5 bn. 485.5 bn. 29 March 1.1189 1.1248 -27.3k -80.3k +0.2 bn. per week 576.1 bn. 488.5 bn. 87.6 bn. 22 March 1.1296 1.1348 -27.2k -77.7k 0 575.9 bn. 489.3 bn. 86.6 bn. 15 March 1.1360 1.1302 -23.3k -75.7k -0.2 bn. per week 575.9 bn. 488.5 bn. 87.4 bn. The following graph shows the last week’s change in EUR/CHF exchange rate. Speculators were net short CHF in January 2015, shortly before the end of the peg, with 26.4K contracts. Then again in December 2015, when they expected a Fed rate hike, with 25.5K contracts. The biggest short CHF, however, happened in June 2007, when speculators were net short 80K contracts. Shortly after, the U.S. subprime crisis started. The carry trade against CHF collapsed. The reverse carry trade in form of the Long CHF started and lasted - without some interruptions - until the peg introduction in September 2011. In mid 2011, the long CHF trade became a proper carry trade - and not a reverse carry trade anymore - because investors thought that the SNB would hike rates earlier than the Fed. They are the equivalent of cash on Swiss bank accounts, when these banks have nothing else to do with this money than giving it to the central bank in the form of “sight deposits of banks”. A: Why is SNB buying FX positions? The SNB buys FX positions, because she considers CHF to be too strong. Hence it would harm in particular the Swiss exports and the jobs in the export industry. A: Why is SNB selling FX positions? To sell FX position is not a deliberate decision, but purely based on the SNB funding situation, as visible in the balance sheet above. 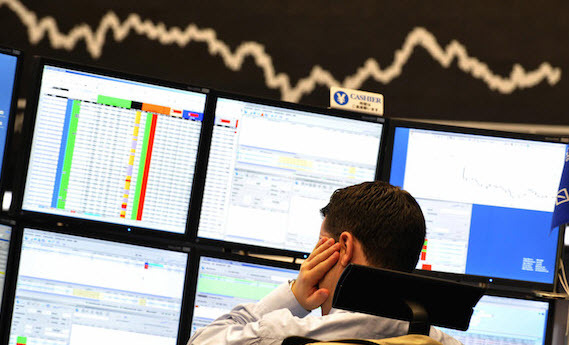 When banks remove funding on the liabilities side of the balance sheet – most the so-called “sight deposits” – then the SNB is forced to sell FX positions on the assets side. 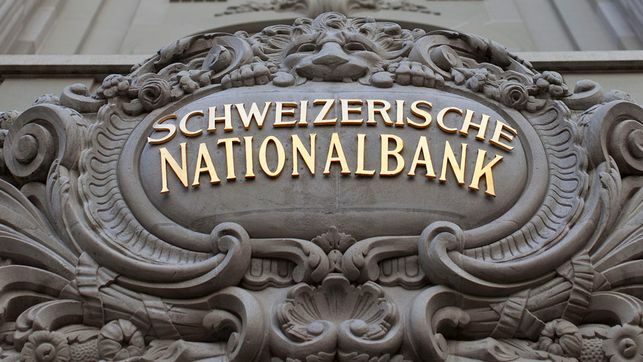 B: Why are banks removing funds from the SNB? Typically banks move the funds to the central bank, when they have nothing better to do with, e.g. (2) invest it in a currency with higher interest rates. Ad (2) Due to regulatory restrictions, banks or insurances cannot easily invest their assets into foreign currency – other from their reporting currency. Hence (2) is mostly driven by hedge funds or speculators, which are not contained in the sight deposits. When banks do not find the demand for loans, then they must deposit the funds at the central bank. There is no other way – apart from keeping the assets as cash. 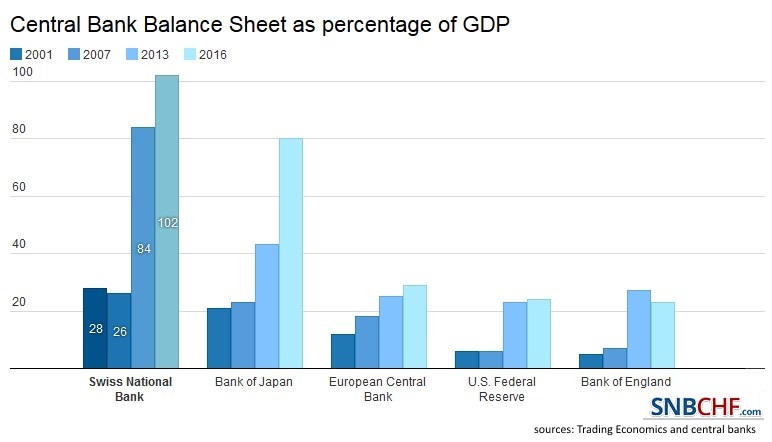 C: Sight deposits are assets for the banks, but liabilities for the central bank. What we explained for the central bank, is also valid for the banks: When foreigners decide to deposits funds on a Swiss bank, then the right side of the bank’s balance sheet rises and so will the left side, the assets. Again when the bank has nothing better to do with these assets, it must (sight) deposit at the central bank, at the SNB. D: When does this vicious cycle end? The “vicious” circle for the central bank, is that it is buying more and more foreign FX. This cycle is only broken when foreigners decide to stop buying assets (e.g. cash, stocks, bonds, houses) denominated in Swiss francs. 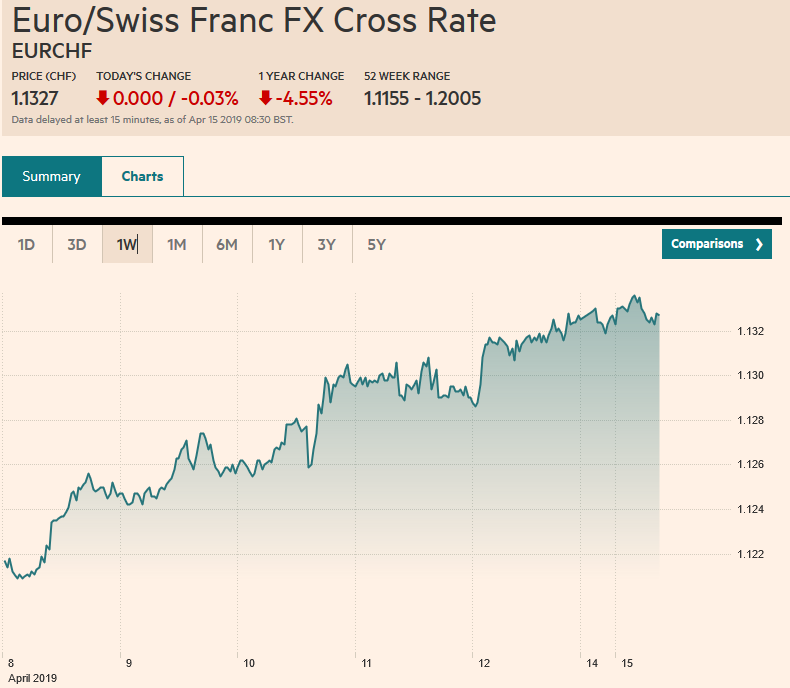 This happens typically when they think that the assets in Swiss Franc are losing too much value. But rising CHF stocks or rising Swiss house prices might counter the falling currency, so that it is still worth buying Swiss assets. Finally we will have to look at the balance of payments. The Swiss current account surplus must be smaller than outflows in the financial account. At the very basis you should understand that FX rates are driven by the balance of payments for this currency, i.e. by inflows of capital or by not existing capital outflows when the country has a current account surplus. These non-existent outflows are very important for Switzerland, a country with a big trade and current account surplus. Capital inflows (or non-existent outflows) can be invested in different types of assets like real estate, stocks, bonds, physical cash or in cash on bank accounts. When investors do not want to buy enough foreign assets for a given (potentially manipulated FX rate), then the central bank might do this instead. This is what we call FX interventions. They are financed with local currency, with the excessive capital inflows or “non existent outflows”. Very often the central bank considers the cash on bank accounts as “excessive”. As opposed to the Bank of Japan, for example, the SNB buys assets denominated in foreign currency. are the equivalent of cash on Swiss bank accounts, when these banks have nothing else to do with this money than giving it to the central bank in the form of “sight deposits of banks”. They are currently the by far most important means of financing for SNB currency purchases, for interventions. 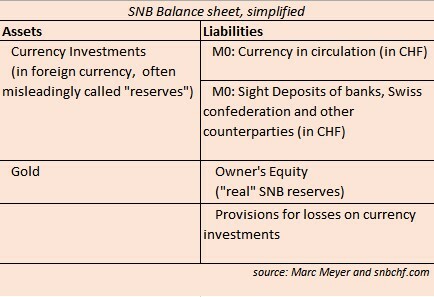 Sight deposits are assets for commercial banks, the Swiss confederation and other counterparties that deposit money at the SNB, but for the SNB they are liabilities, debt. Sight deposits are always denominated in CHF. 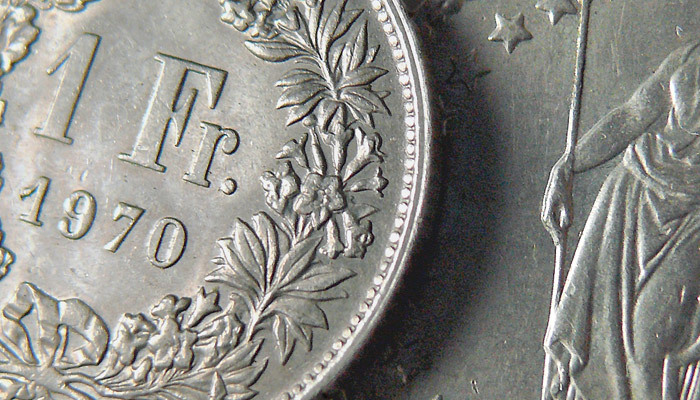 The SNB finances itself with Swiss Francs, while its assets are nearly all in foreign currency. When CHF appreciates, then the debt increases more than the assets. The assets lose their value. As consequence the central bank may lose its Owner’s Equity which may result in a central bank bankruptcy or a recapitalization by the Swiss state. The IMF-compliant weekly monetary data release on the SNB website provides the recent developments in sight deposits. With this weekly delivery it gives an far earlier indication of SNB interventions than the relatively late releases of balance sheet or IMF data. Currency in the form of bank notes and coins is the second financing method, it represents the “traditional money printing” of central bank debt with the printing press. Nowadays this printing of debt in the form of bank notes is far less important than the electronic printing of SNB debt called “sight deposits”. is the popular word for unsterilised central bank interventions that – at least for monetarists – paves the way for price inflation. In the following we concentrate on sight deposits as means of money printing, because currency in circulation changes far less than sight deposits. 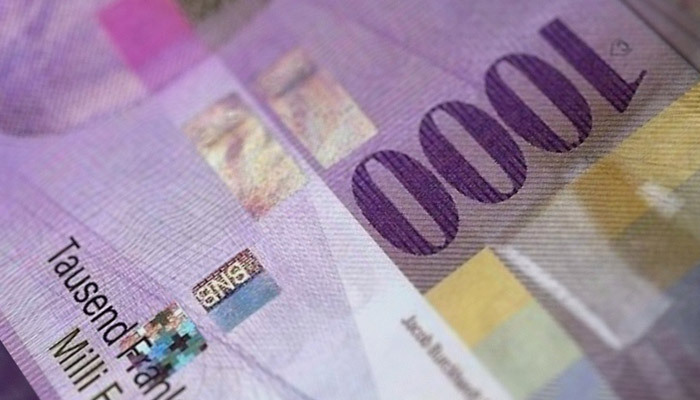 From October 2014 to October 2015, the SNB printed new bank notes of a total of 6 billion CHF but electronic money (sight deposits) rose by 100 billion francs (see the SNB balance sheet). are the ones of other counter-parties with an account at the SNB. These include loans from the Swiss confederation and federal authorities like the state pension fund (In German “AHV”). Other counter parties are insurances, private pension funds, settlement agencies, foreign banks, investment companies, hedge funds and foreign central banks and institutions. These other sight deposits are not part of M0, because they are not able to “multiple money” with loans to the public (no money multiplier effect). Since December 2014, sight deposits above the threshold of around 320 bn. are “punished” with negative rates (20 times more than the minimum reserves, visible in “compliance in %” on the monetary data). The punishment fee is currently 0.75%. Hence by End of November 2015, around 148 bn. CHF are concerned by the negative rates, while the 320 bn. are “exempted”. Between November 2015 and April 2016, sight deposits increased by 22 bn. . Since the exemption level did not increase, all these 22 bn should be punished by 0.75%. The SNB achieved a profit of 333 million on negative rates only in Q1/2016. Very often the speculative position against CHF builds a counter-position against sight deposits. Rising sight deposits indicate that – net real money flows into CHF or remains in CHF. Net real money inflows indicates that the Swiss private sector does not buy enough foreign assets – like foreign stocks, bonds and foreign investments – to counter the strong Swiss current account and trade surplus. Instead the SNB buys the foreign assets, it intervenes. The term net real money stands for current account surplus minus capital account outflows (see the balance of payments background). Like any carry trade, this imbalance between FX speculation on CHF Short and real money CHF Long must break down one day – just as seen on January 15th 2015 or during the financial crisis. Example: The data graph shows that real money went long 13.1 billion CHF during the week of Jan 15, 2015, but FX speculators were short CHF by 26444 x 125K contracts. Speculators got ripped off by real money. It is also visible that only in November 2014, the SNB started to intervene: delta sight deposits remained at zero before. how it sold FX positions since Summer 2017. The terms are explained in the sections above. 12 April, 2019 1.1294 1.1276 -26.3k +0.3 bn. per week 576.6 bn. 484.7 bn. 91.9 bn. 05 April, 2019 1.1209 1.1218 -26.3k +0.2 bn. per week 576.3 bn. 485.5 bn. 90.8 bn. End March, 2019 1.1189 1.1248 -27.3k -0.4 bn. per month 576.1 bn. 488.5 bn. 87.6 bn. End February, 2019 1.1350 1.1335 -18.1k -0.2 bn. per month 576.5 bn. 493.6 bn. 82.9 bn. End January 2019 1.1319 1.1373 -22.9k +2.5 bn. per month 576.7 bn. 481.7 bn. 95.0 bn. End December, 2018 1.1262 1.1397 -22.9k -2.7 bn. per month 574.2 bn. 479.0 bn. 95.2 bn. End November, 2018 1.1310 1.1339 -21.0k -1.1 bn. per month 576.9 bn. 472.0 bn. 104.9 bn. End October, 2018 1.1387 1.1418 -17.1k +0.1 bn. per month 578.0 bn. 470.0 bn. 108.0 bn. End September, 2018 1.1368 1.1686 -16.0k +1.7 bn. per month 577.9 bn. 474.8 bn. 103.1 bn. End August, 2018 1.1337 1.1658 -44.7k -0.2 bn. per month 576.2 bn. 477.8 bn. 98.4 bn. End July, 2018 1.1602 1.1678 -45.8k 0 576.4 bn. 476.5 bn. 99.9 bn. End June, 2018 1.1549 1.1640 -38.0k -0.2 bn. per month 576.4 bn. 469.3 bn. 107.1 bn. End May, 2018 1.1640 1.1725 -37.3k +1.6 bn. per month 576.6 bn. 466.3 bn. 110.3 bn. End April, 2018 1.1968 1.2160 -10.2k -0.3 bn. per month 575.1 bn. 471.1 bn. 104.0 bn. End March, 2018 1.1762 1.2356 -9.4k -0.6 bn. per month 575.4 bn. 469.2 bn. 106.2 bn. End February, 2018 1.1526 1.2331 -15788X125K +1.0 bn. per month 576 bn. 460.2 bn. 115.8 bn. End January, 2018 1.1695 1.2370 -22115X125K +1.8 bn. per month 575 bn. 465.1 bn. 109.9 bn. End December, 2017 1.1713 1.1911 -13902X125K -4.2 bn. per month 573.2 bn. 473.4 bn. 99.8 bn. End November, 2017 1.1645 1.1815 -27983X125K -1.1 bn. per month 577.4 bn. 477.9 bn. 99.6 bn. End October, 2017 1.1618 1.1698 -11597X125K -0.5 bn. per month 578.5 bn. 469.4 bn. 109.1 bn. End September, 2017 1.1434 1.1799 -1862X125K -0.2 bn. per month 579.0 bn. 473.0 bn. 106.0 bn. End August, 2017 1.1438 1.1921 -1778X125K +0.1 bn. per month 579.2 bn. 468.5 bn. 110.7 bn. End July, 2017 1.1184 1.1691 -1550X125K +0.5 bn. per month 579.1 bn. 478.9 bn. 100.2 bn. End June, 2017 1.0913 1.1353 -4669X125K +2.6 bn.per month 578.6 bn. 490.0 bn. 88.6 bn. End May, 2017 1.0912 1.1202 -19785X125K +4.5 bn. per month 576 bn. 489.3 bn. 86.7 bn. End April 2017 1.0832 1.0895 -17317X125K +9.8 bn. per month 571.5 bn. 479.5 bn. 92.0 bn. End March 2017 1.0709 1.0754 Eurozone core inflation only at 0.7% -16392X125K +13.5 bn. per month 561.7 bn. 475.1 bn. 86.6 bn. End February 2017 1.0648 1.0570 New record in Swiss trade surplus -8936X126K +15.4 bn. per month 548.2 bn. 470.2 bn. 78.0 bn. End January 2017 1.0718 1.0725 US Q4 GDP only +1.9% -13644X125K +3.8 bn. per month 532.8 bn. 466.7 bn. 66.1 bn. End December 2016 1.0728 1.0467 -10091X125K +1.5 bn. per month 529.0 bn. 466.3 bn. 62.7 bn. End November 2016 1.0749 1.0786 Election of Donald Trump, Renzi loses referendum in Italy -24334X125K +9 bn. per month 527.5 bn. 457.6 bn. 69.9 bn. +1.1 bn. per month 518.5 bn. 451.9 bn. 66.6 bn. +1.6 bn. per month 517.4 bn. 452.9 bn. 64.5 bn. End August, 2016 1.0961 1.1169 Not convincing U.S. jobs numbers, that may delay a Fed rate hike. +4.4 bn. per month 515.8 bn. 438.7 bn. 77.0 bn. Previous Record High 1.2047 1.2927 Nov2012:-3367x..
Roger: Are there other explanations than interventions for increased sight deposits? So when cash is converted into sight deposits at the SNB, then this may happen without interventions. But sight deposits increase. Roger: The SNB buys in any case, even if the rate is high. Why? George Dorgan: Yes you are right. But interventions at too high levels, is a potential risk for SNB’s solvability. But why does she do it? 1) If the SNB sells the EUR/CHF or does not buy at all, then the EUR would move downwards. The bank does not like this. 2) The SNB wants to support the carry trade, the upwards trend of EUR/CHF. Remember that the SNB sold euros in early 2012 so that the euro went slowly towards 1.20. Roger: Is it possible that money isn’t credited to an account instantly but after a few days, right? Last week the deposits increased. This could be because of interventions in the last week or the week before, right? But in the last two weeks the Euro-Franc exchange rate was pretty high. Speculative positions against CHF (CHF short) may be higher than CHF sight deposits (CHF Long). The CFTC position is only a part of the total spec position. Brokers and foreign banks hedge some of their client EUR long positions with SNB sight deposits or indirectly via Swiss banks like UBS. When and how much they hedge, depends. As January 15th shows, banks are usually not completely hedged. You might get confused with this answer, read more here why sight deposits can be viewed in two ways, depending who creates them, the central bank SNB or the commercial banks that deposit funds. rates does it consist of? Your response would be very appreciated. Similar to the Bank of Japan, the SNB has a long tradition of paying zero on its sight deposits, the Fed currently pays a little more. With the move into negative rates, sight deposits above a certain threshold must pay negative rates. “Better to go to the market” is no alternative, because the LIBOR market is empty. Any Swiss bank has too much money. So if you have money then nobody wants it, even more you must pay to give the money to somebody (negative LIBOR rates). FX interventions are not sterilized in the sense that they cannot be used for the multiplier effect, that they may prop up lending. The main method of financing are sight deposits. SNB bills are sterilized, but they do not exist any more since 2011. The latest target LIBOR is about -0.75%, but as said everybody has enough liquidity. It is very confusing in my mind , those increase of sight deposits are coming from where ? These sight deposits are used to maintain the peg ? I understand that banks are “over-liquid” and don’t need money for lending or liquidity management. But actually I was thinking about such a possibility for arbitrage for banks: to borrow on the market at -0,75% and to deposit with the SNB at 0%? 2) They deposit the money on a Swiss bank account in CHF. This would be a “sight deposit at the Swiss bank”. 3) The bank does not know what to do with the funds, it does not lend it. 5) The quantity of sight deposits depends on the price of CHF: If CHF is expensive for foreigners then they may choose the dollar instead to save their money. If CHF is cheap like EUR/CHF =1.20 then it is more. It is true that it’s possible that money isn’t credited to an account instantly but after a few days, right? Last week the deposits increased. This could be because of interventions in the last week or the week before, right? But in the last two weeks the Euro-Franc exchange rate was pretty high. Does this mean the SNB buys stuff in any case / even when the Euro-Franc exchange rate is pretty high? Another question: Are there other explanations than interventions for increased sight deposits? Yes, the SNB buys in any case, even if the rate is high. Why? 1) If the SNB sells the EUR/CHF or does not buy, the EUR would quickly move downwards. So if cash is converted into sight deposits, then this may happen without interventions. Your website is really nice for anyone looking for detailed information on the SNB policy, thanks for keeping it updated. I have a question on your post, I found it clever to show the correlation between CFTC Positions and SNB FX interventions, but I don’t find the correlation particularily convincing. Couldn’t one find another variable to “predict” SNB interventions ? To put it differently, isn’t there any others indicator that could help “predict” SNB interventions ? Sight deposits are the earliest indicator of interventions apart from market chatter. Be aware that in most cases there is no correlation of CFTC and sight deposits. 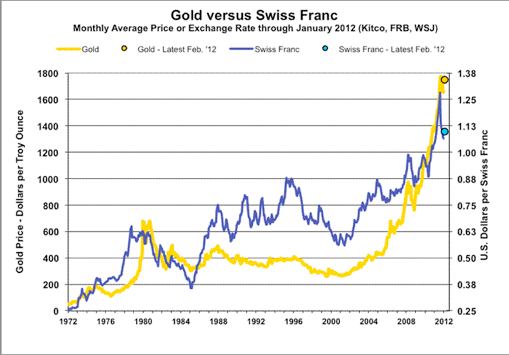 The aim of the graph is to show when one should not be short CHF. I was thinking from your graph CFTC positions were one of the factors the SNB could look at when deciding to intervene or not, now I get what you wanted to show. Ok for market chatter, thanks. A big part of negative or near-zero yield is the expectance that CHF will be stronger than EUR or USD. SNB now has third-highest FX reserves (China and Japan highest and second-highest. Previously Saudi Arabia was third-highest but its reserves position declined due to the decline in oil prices. The Wikipedia page could need an update, because they include gold in the Foreign exchange reserves. It is a difference if you own gold or fiat as reserve. Hi guys – thanks for the great posts. Just wondering when did you change your outlook that things were going to head down (to parity) before they would head back up again? Also noting that you had previously mentioned about the bands that the SNB is comfortable where the EUR sits. I.e. 1.068 was at the low end of their comfortable range. “Comfortable” due to their assets being mostly denominated in EURs; assets reduce, then relative debt increases. Ageing and increased saving during the years before the pension: The Eurozone is currently following Japan; this means temporarily low inflation. But finally there will be a shortage of labor and rising prices. Switzerland will follow only later – in particular because the Swiss import the needed labor. Productivity increases in China or other Asian economies, when people move from rural areas to the cities and provide manufactured goods for advanced economies. This “core theme” from Michael Pettis is still happening today, it should end in about 20, maybe 30 years. Productivity increases that cannot be not measured in terms of GDP (remember that productivity=GDP/hours worked). This happens when you create better company processes without the need for investment (which again is part of GDP) – thanks to the internet and computer-driven economy. Switzerland is one of the leaders in improving processes – last but not least, because of the high labor costs.. 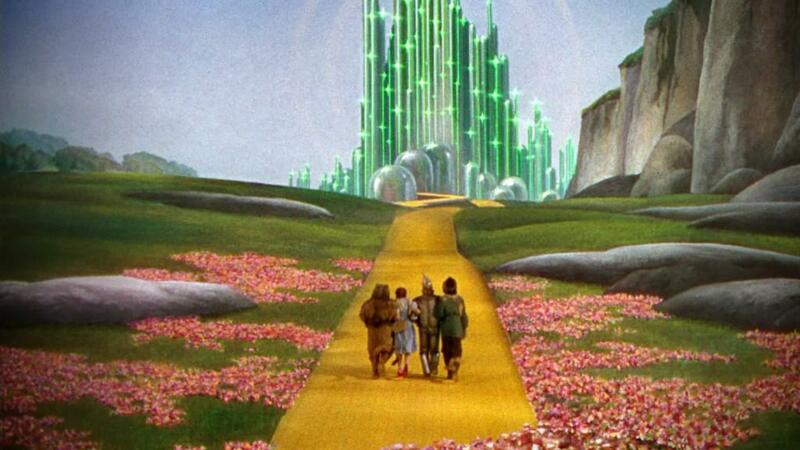 In my original thesis, I took a simple assumption, namely the typical business cycles of seven years. But I ignored that these deflationary factors delay the second part of the game, the inflation game. Look at Japan, then you see how deflationary pressures can persist in an ageing, but not yet over-aged society. I would hence adjust my estimate to 20-25 years, not 7. My gut feeling as per beginning of 2018 says that we are getting closer to the inflation game. Last and IMHO most importantly, for the first time there are prolonged negative real interest rates in Switzerland . This is in some sense in contradiction to the SNB’s objective to preserve the value of money, so they will have to loosen their grip on the CHF. This is true when taking the 3M libor as a basis (source: UBS chartset p. 57 for download here: https://www.ubs.com/global/en/wealth-management/chief-investment-office/key-topics/2017/ch/swiss-economic-forecast.html).